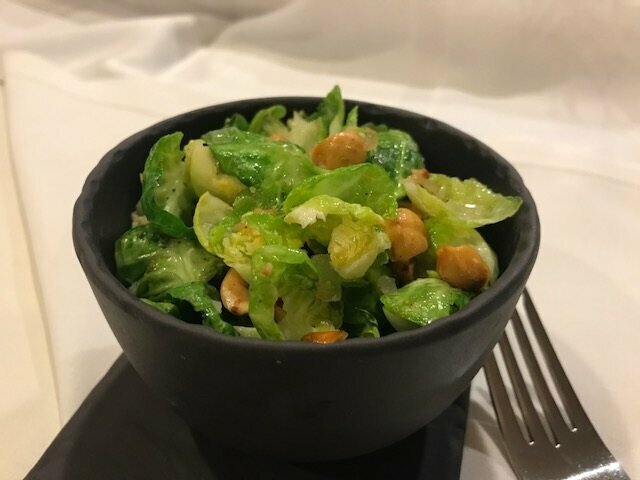 Instead of whole Brussels sprouts, in this recipe the leaves are separated out individually and then quickly pan seared with hazelnuts for added crunch. The recipe was inspired by a dish served at the urban style restaurant, Riffs on Boulder’s Pearl Street Mall. Put the hazelnuts on a baking sheet and preheat the oven to 350 degrees F. When heated, place the baking sheet on the middle rack of the oven and toast, stirring the nuts frequently, until they are lightly browned to the core and skin has begun to separate. This will take about 10 minutes. Immediately transfer nuts onto a clean kitchen towel laid out on the counter and wrap the towel around them. Using your hands, roll the nuts around in the towel and rub them to remove the skins. Discard the skins and roughly chop the nuts, then set aside. Meanwhile, trim the stem ends off of the Brussels sprouts and using the tip of a sharp paring knife carve out the core of each. With your fingers, separate the leaves and place them in a strainer. Toss under cold running water to rinse well and set aside. The nuts and Brussels sprouts can be prepared in advance, nuts kept at room temperature, Brussels sprouts covered and refrigerated, for up to 3 days. Just before serving, in a large skillet heat the olive oil over medium high heat until hot, but not smoking. Add the onion and toss to coat with oil, then reduce heat to medium and cook, stirring frequently, for about 3 minutes before adding the garlic. Reduce heat more and cook, stirring often, for another 8 minutes until onions are translucent, but not burned. Raise the heat again to medium high. Add the Brussels sprouts leaves and toss to coat with oil. Cook for about 3 minutes, tossing constantly. Stir in the chopped nuts and season to taste with salt and pepper. Continue to cook, tossing, until the leaves are bright green and just tender, about 4-5 more minutes. Immediately turn out into individual or one large dish. Serve piping hot.